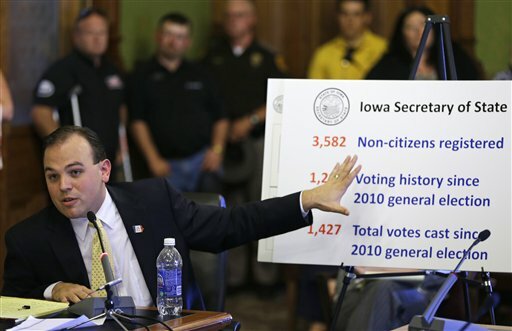 Iowa Secretary of State Matt Schultz explains his theory of illegal registrants on the state voter rolls. Thirty-one U.S. states currently have laws in place that require voters to show some sort of ID at the polls — almost all passed in the last three years by GOP state legislatures and enforced by Republican secretaries of state. Almost to a fault, the laws are designed to disenfranchise African-American voters (I know, I know, everybody says “minority” but what they mean is black urban voters of all ages). Iowa appeared to top the list in recent months as the 32nd state with new and restrictive voting laws, but with a twist: With more than 93 percent of the state population reported as white and blacks registering only 3 percent, GOP Secretary of State Matt Schultz aimed his directive at Iowa&apos;s Latinos. Hispanics are only five percent of the population in Iowa but they’re suddenly crucial. Since the 2008 elections, in which they overwhelmingly supported Barack Obama, Latino voter rolls have increased from 30,000 to more than 50,000 in the state. And with Obama and Mitt Romney in a dead heat in Iowa, those votes can&apos;t be ignored. So what did Schultz do? Well, first he decided he had an emergency on his hands — a real, honest to God emergency. Then he compared names on voter rolls to a state transportation database and determined he had 3,582 illegal registrants. How this comparison revealed that is, so far, Schultz&apos;s secret. Then Schultz created two new voting rules using an emergency administrative process which allowed the exclusion of public hearings or community input of any kind. One of the rules would have challenged the voting rights of persons who appear on government databases as non-citizens. The second rule would have supposedly made it easier to report alleged voter fraud. Schultz armed himself with two letters to send to these individuals in order to get them to prove their citizenship. They can be found at the bottom of this link to a story in the Des Moines Register, and they’re pretty special. The first letter Schultz planned to send to those 3,582 suspected non-citizens lists four types of IDs to prove citizenship, none of which are a voter ID card, a social security card, or a state ID. The second letter is a reminder that just happens to include this sentence: Please note that voter registration fraud is a Class "D" felony in the state of Iowa. Because that’s not too intimidating. Last Friday, District Court Judge Mary Pat Gunderson — a Republican judge with a long history in Iowa GOP circles — responded to a suit against Schultz filed by the Iowa&apos;s ACLU and the state’s League of United Latin American Citizens by issuing an injunction that prohibits Schultz from enforcing his rules. Gunderson said Schultz had plenty of time to follow procedure for community input and that the emergency procedures hadn&apos;t been necessary. She didn&apos;t throw the rules out per se, but she set them aside until after the election. Schultz, who won his post in a squeaker just one year ago, is now threatening to sue to get access to a federal data base to crosscheck those 3,582 votes anyway. With the presidential race so close, those votes could really make the difference. This is the second in an occasional series. In the next few weeks, I&apos;ll be looking at how Latinos — the so-called swing vote in this year&apos;s presidential election — play in each of the states where the race is within a few percentage points. Read part one in the series here.